In 2009, UN Secretary General Ban Ki Moon stated that, “with more than half of the world’s population living in cities today, we are indeed living in an urban century.” Indeed, urbanization is occurring rapidly in the developing world, where cities gain an average of 5 million residents every month (UN-Habitat, 2009). The most visible effect of urban expansion is discernible at the peri-urban environment. In developing countries, peri-urban areas are characterized by fast population growth, a mixture of planned and unplanned settlements, inadequate service infrastructures, environmental and health problems. These present a significant challenge to planners as they struggle to ensure a harmonious development of this zone. Cameroon has not been spared in the current wave of rapid and uncontrolled urban growth which extends at the peri-urban fringes. As in other West African nations, the pace of urbanization in Cameroon has been very rapid. From 1976 to 1988, the rate of urbanization grew from 28.5% to 40.4% (Fombe and Balgah, 2010) with the current figure at around 45%. This rapid urbanization is easily observed in Douala (especially in the Bonaberi district), and Yaounde, where dramatic growth can be seen in neighborhoods such as Emombo, Simbock and Nkolbisson. In Buea, the historic capital of German Kamerun, this settlement expansion presents a number of planning challenges which must be addressed. Cameroon’s Vision 2035 has as a challenge the need for urban development, regional development, and environmental protection. While research efforts have been directed on urbanization and environmental problems (Amawa and Kimengsi, 2009; Kimengsi and Amawa, 2012; Balgah, 2007; Tosam, 2012), much attention still needs to be paid to the growth of peri-urban areas. The case of Buea provides an insight into the planning challenges of peri-urban settlement growth and suggests recommendations to development stakeholders to support the formulation of policies for the sustainable development of these zones of transition. Peri-urban dynamics in Buea have been characterized by changes in land use, including a sharp decrease in agricultural use, down from 80% in 2000 to 50% in 2014. There has also seen a progressive increase in settlements, from 9% in 2000 to 23.3% in 2014. 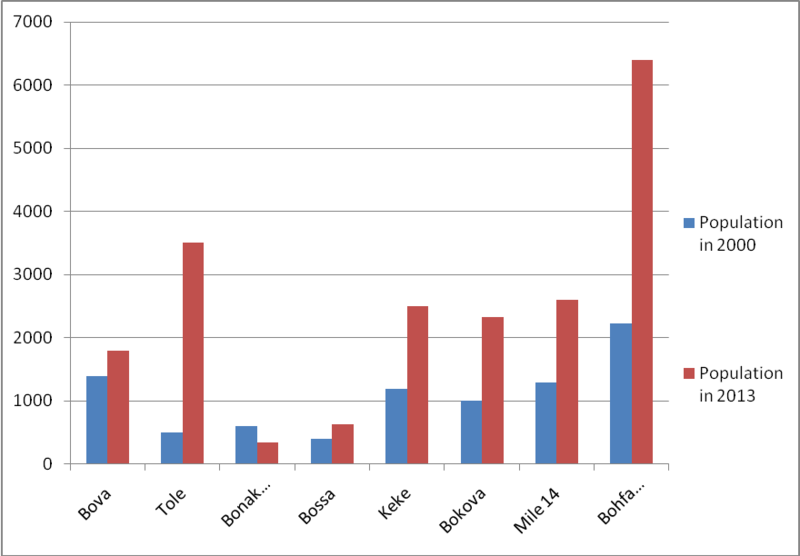 Manufacturing and commercial activities which were absent as of 2000 now occupy 5% and 10% of the land use surface of the Buea peri-urban environment respectively (Table 1). In 2000, the peri-urban environment occupied a surface area of 10 km2 (Figure 1). However, due to a number of factors such as population growth, the need for space to accommodate human activities, high cost of land in the inner city of Buea, and the availability of cheap land at the fringes, there has been significant transformation of the peri-urban landscape, increasing in size to 25 km2 in 2014 (Figure 2). All peri-urban settlements in this study have witnessed at least a more than 25% increase in population between 2000 and 2014, with the most significant increases occurring in the settlements of Bolifamba and Tole (Figure 3). The factors which acted as a population trap to the growth of the peri-urban environment can be analyzed from economic, political, and social perspectives. Economically, the huge agro-industrial plantations, which date as far back as the German Colonial Era, pulled in migrants from the northwest and western regions of Cameroon, and from neighboring Nigeria. Its potential for tourism, such as the forest reserves and Mount Cameroon National Park, as well as the fairly good communication network contributed to the influx of migrants into this area. Buea’s peri-urban environment is lodged politically within the politico-administrative town of Buea. This has led to an influx of civil servants who could not secure living space in urban Buea, resorted to the peri-urban environment. Socially, the introduction of secondary education by missionaries during the colonial period, and the presence of health facilities also acted as a draw for migrants. It is important to mention that the creation of the University of Buea in 1993 marked a turning point in the urban growth process of Buea and its peri-urban setting. This growth has introduced a host of challenges to include poor planning, poor housing construction, waste disposal problems, the absence of basic services, insecurity and the disappearance of forests. As the pace of urban development increases, the growth of the peri-urban environment is imminent. This growth, along with the associated pressures on local populations, land values, and availability of affordable housing among others will continue to introduce a number of challenges with respect to the provision of water, sanitation, and health care. To control the growth of haphazard settlements on the peripheries of urban boundaries, we recommended that city authorities conduct regular checks to ensure proper housing construction. Furthermore, waste management programs should be developed with peri-urban environments, including regular waste collection and treatment (reduce, reuse, recycle, and restore). Peri-urban dwellers should respect town planning regulations, consult development experts, coordinate growth, and notify the authorities where necessary in the case of any problems. Strategic planning is needed to achieve development outcomes. This should include an updated master plan, and the expansion of utilities (water supply, electricity, sanitation). Dr. Jude N. Kimengsi is Senior Lecturer and Head of the Department of Geography and Environmental Studies a the Catholic University of Cameroon (CATUC) in Bamenda. Solange Akhere Gwan is a graduate student in Development Geography at the University of Oslo, Norway. Eling Lyonga emmanuel is Chief of Works at the Buea Muncipal Council in Buea, Cameroon. The recommendations postulated above are very great, also further training of staff in the development section is highly required within the Territorial Decentralized Collectivities like the Councils that are highly involved in local development. This can be via workshops, seminars etc. of which they will understand and interpret the development and strategic plans prepared for the different localities. the work is good, but i think Cameroon town planners should think more on green real estate projects. i agreed with Mr. TETA that the peoples involve need training and advancement in technology is transforming the globe rapidly.